I must give Topps some credit for knowing how to proactively kill anticipation for a new product. 2014 Heritage hit the hobby stores on Friday of last week, but as of last night, I still haven’t seen Heritage at any of the three Target locations closest to me. I’m wondering whether I should start a countdown of the number of days it took to reach retail outlets after the set was officially released. At least I have the three Phillies Real One Autographs from this year’s set in my hands — they’re the only cards from the set that I own thus far since I decided that I am going to compile my own team set as I simultaneously assemble a complete base set. At least, that was the plan. If that wait goes on much longer, I’m going to just give up and purchase complete base and team sets off of eBay. I don’t care if the lack of retail product is technically a distributor problem — I still hold Topps responsible. 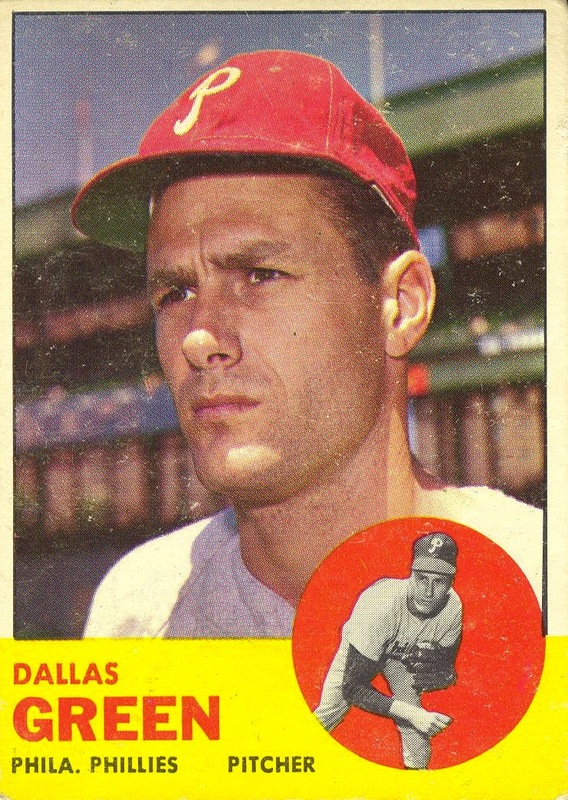 I should also give Topps demerits for sheer-headed stubbornness. While I suppose I’m not surprised, I still couldn’t help but be disappointed when I saw the first 1965 U.S. Postage Stamp inserts appear on eBay. 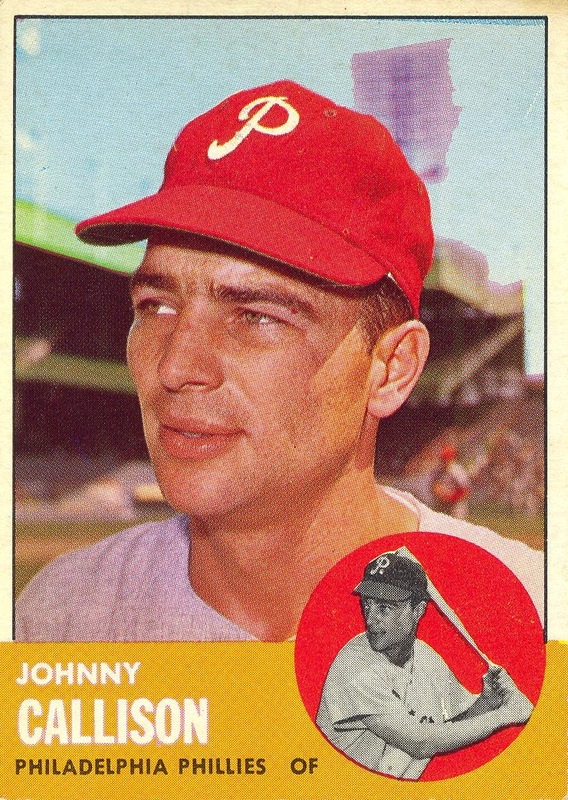 I adamantly refuse to look through the collection and count the number of times they’ve done so, but Topps once again used a photo of Jim Bunning from an incorrect era in a one of the Heritage insert sets. I know what’s really going on — it’s the same photo of Bunning they used in last year’s Now & Then insert set, and we all know how much Topps just loves using the same damn image ad nauseam. However, it would really be nice to see Topps just once use a picture that properly aligns with the year that they are attempting to honor. I suppose it really is too much to ask Topps to pay any attention to this sort of detail. As has been the case for many years now, I am eagerly looking forward to the next release of Topps Heritage. It’s hard to believe that this particular brand is entering its 15th year, and it’s even harder to believe that in less time than that the Heritage brand will start reusing set designs from my youth — assuming that Topps is still issuing such sets in the year 2026. As is what I assume is true for other collectors, my eagerness to see a particular Heritage set varies based on how much I liked the original off of which its based. It just so happens that the 1965 design is one of my all-time favorite vintage Topps designs, so I’m really excited about this year’s set. In fact, I love the design so much that I almost found it in my heart to forgive Upper Deck for badly ripping it off with their 2003 Upper Deck Vintage set. So, in addition to assembling something close to a master team set of Phillies and a complete base set, I’m seriously considering collecting all the SPs in order to have a full, complete set — though not with any of the various gimmicky variations that Topps seems to love creating. However, that’s not the only reason I’m eagerly awaiting the arrival of Heritage in stores next week. A few days ago, Topps released the checklist for the set, and one of my Wish List Items for 2014 was in there: a Dallas Green autograph card. Because I’ve been complaining about the lack of one for some time now, a couple months ago I decided I was tired of waiting and purchased a slabbed PSA/DNA Green autograph card. I must to admit to being slightly annoyed with myself for not being patient for just a few months longer, but on the other hand, this is the sixth year in a row in which Topps could’ve issused a Real Ones Autograph for Green. I think my inability to believe that Topps would actually issue one is somewhat justified. There are two other Phillies from the 1965 set who are also getting Real One Autographs: Frank Thomas and Ed Roebuck. 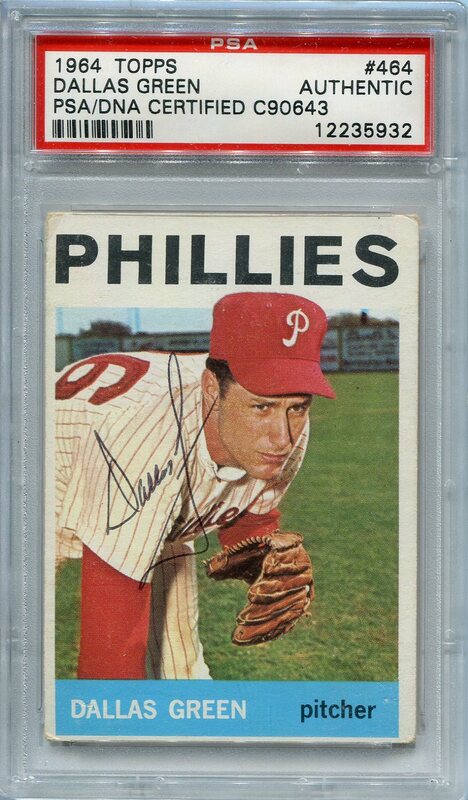 I’m never going to complain when a current or former Phillie receives his first autograph card, but my excitement over the Green card was dampened by the realization that once again Topps passed on issuing Ruben Amaro, Sr., Art Mahaffey, Tony Taylor, or Cookie Rojas autograph cards. 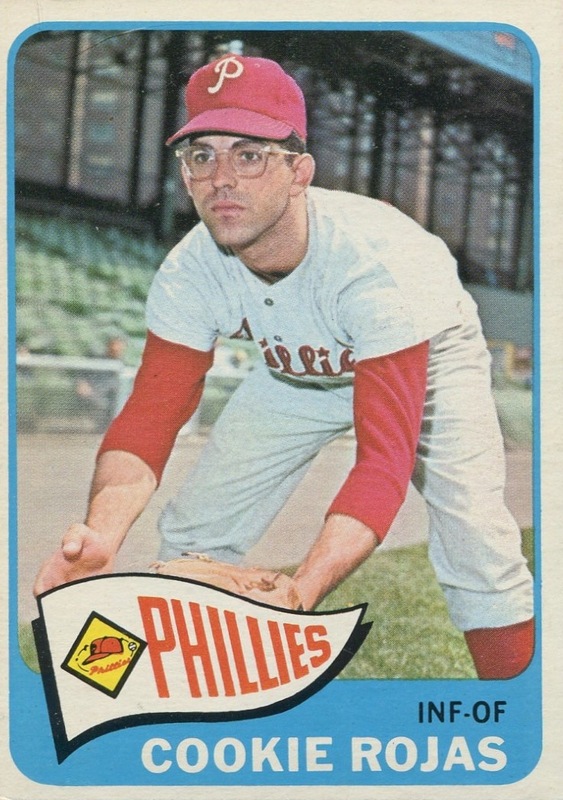 If Rick Wise isn’t included in next year’s Heritage offering, I’m going start holding that against Topps as well. One final note, given that Topps included historically-based variations in previous Heritage sets, keep a close watch on the Phillies logos in this year’s set. 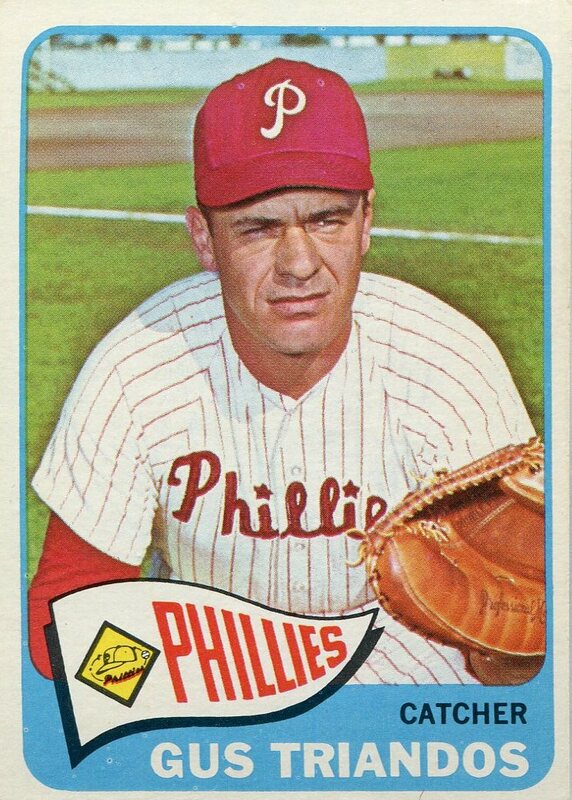 Although #248 was not assigned to a Phillie again in this year’s Heritage (it went to Pete Kozma of the Cardinals), in the original 1965 set, the Phillies cap in the Phillies logo on Gus Triandos’s card wasn’t properly colored red — it was the same yellow as the background in the rest of the logo. Therefore, it’s possible that Topps could mess up the logo coloring on some other Phillies card this year, though it’s just as likely that Kozma’s card will bear the lack of proper coloring, should Topps choose to replicate that particular error with a variation card. When I posted the 2012 Topps Heritage 1963 Buybacks checklist last week, I paused when I added the scan of the Ruben Amaro, Sr. card. What caught my eye was the team designation: “PHIL. PHILLIES.” This suddenly got my attention because on all the 2012 Heritage cards, it’s completely spelled out as “PHILADELPHIA PHILLIES®” (yes, complete with the annoying little registered trademark symbol that is now apparently required whenever the team name is listed on the baseball card). Did Topps completely frak up a little detail when putting together this year’s Heritage set? Well, no… not exactly, that is. Topps actually had the team name listed both ways throughout the set. Better still, there is no discernible pattern that helps to understand why some cards got spelled out while others didn’t. I checked the series in which the card appeared, player position, and the color combination of the border and the inset photo background — in every case, there were instances of the team name either completely spelled out or abbreviated. I did a cursory check on eBay to see if I could find any players who had cards with both of the team designations (admittedly, hoping to find a previously uncatalogued variation), but no luck. It appears that Topps consistently used the same designation for each player. The only thing that I determined was that more cards carried the abbreviated spelling than the full team spelling. The really amazing thing to me is that I never noticed this before. I don’t know if anything similar happened in the set with any of the other teams, but it completely surprised me to discover this little inconsistency so long after first adding 1963 Topps cards to my collection. It’s a shame that someone at Topps didn’t notice this before putting out this year’s Heritage set. 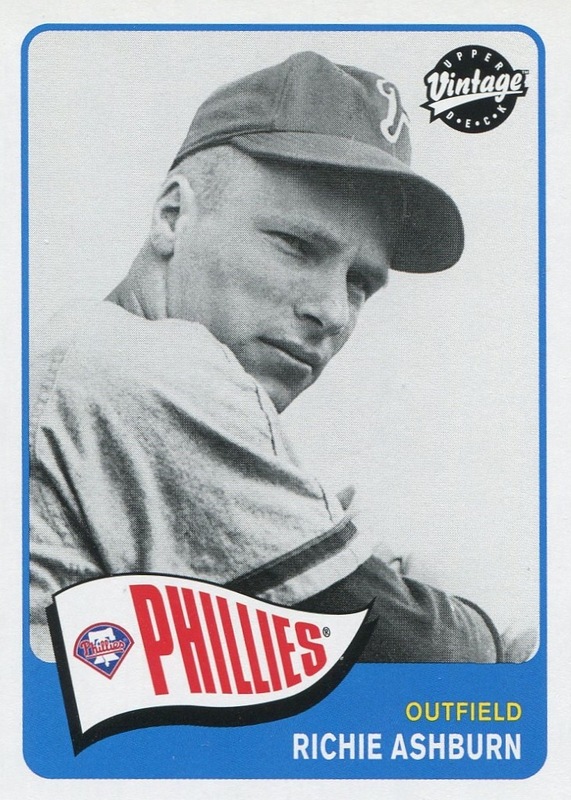 They could have created variations on a few choice Phillies cards as a nod to the overall inconsistency in the original 1963 offering. At least, I think that would have been (initially, anyway) far more interesting than many of their fabricated variations with no historical basis in the ’63 set. 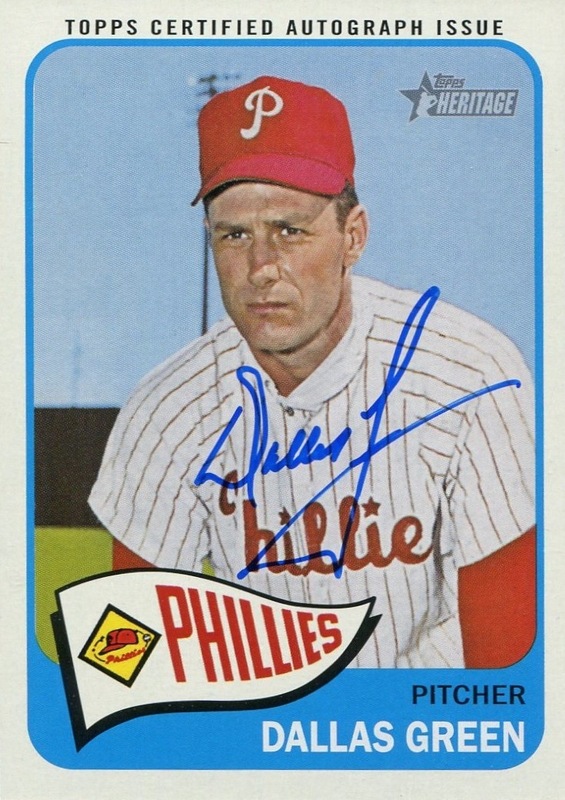 The truly amazing thing to me is that I’ve been building a collection exclusively of Phillies cards for nearly 25 years now, and I only just now noticed this little quirk. Given Topps’s long-established track record of shoddy reproductions of their own product, I can’t blame them for not noticing either. Nonetheless, it would have been really nice if someone over there had noticed and found a way to incorporate this quirk in this year’s Heritage offering.